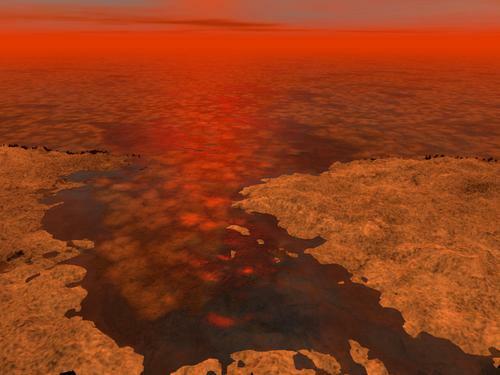 Although surface temperatures on Titan are cold enough that methane can exist as a liquid, filling lakes and flowing in streams, it may sometimes get so cold that even the liquid methane and ethane freezes, forming floes and icebergs of frozen hydrocarbons. This Titanic revelation was announced today during the 221st American Astronomical Society meeting in Long Beach, CA. Titan is the only other body besides Earth in our solar system with stable bodies of liquid on its surface. But while our planet’s cycle of precipitation and evaporation involves water, Titan’s cycle involves hydrocarbons like ethane and methane. Ethane and methane are organic molecules, which scientists think can be building blocks for the more complex chemistry from which life arose. Cassini has seen a vast network of these hydrocarbon seas cover Titan’s northern hemisphere, while a more sporadic set of lakes bejewels the southern hemisphere. If the temperature drops by just a few degrees, the ice will sink because of the relative proportions of nitrogen gas in the liquid versus the solid. Temperatures close to the freezing point of methane could lead to both floating and sinking ice – that is, a hydrocarbon ice crust above the liquid and blocks of hydrocarbon ice on the bottom of the lake bed. Scientists haven’t entirely figured out what color the ice would be, though they suspect it would be colorless, as it is on Earth, perhaps tinted reddish-brown from Titan’s atmosphere. Cassini’s radar instrument will be able to test this model by watching what happens to the reflectivity of the surface of these lakes and seas. A hydrocarbon lake warming in the early spring thaw, as the northern lakes of Titan have begun to do, may become more reflective as ice rises to the surface. This would provide a rougher surface quality that reflects more radio energy back to Cassini, making it look brighter. As the weather turns warmer and the ice melts, the lake surface will be pure liquid, and will appear to the Cassini radar to darken. No, floes. As in slabs of floating ice.